With advanced microprocessor technology and state-of-the-art silicon pressure sensors, the 672 series precision pressure calibrators provide a pressure calibration solution for gauges, transmitters, and switches over a wide pressure range. The 672 is a very portable device and can measure pressure precisely with a built-in pressure sensor, as well as read the current or mV produced by a transducer. 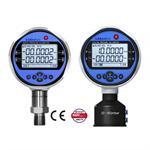 It can even supply an excitation voltage to power sensors or transmitters during calibration. In order to reach 0.02% F. S. accuracy up to 10,000 psi (700 bar) and 0.1% F. S. accuracy up to 40,000 psi (2,800 bar), every silicon pressure sensor in our gauges has been specially aged, tested and screened before assembly. 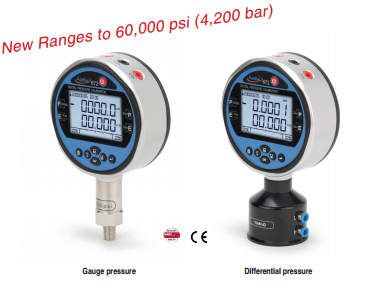 The 672 series precision pressure calibrators are unmatched in performance and reliability. which is 0.05%FS calibration accuracy and 0.05%FS yearly stability. View the Data/Spec Sheet. View the Manual. Understanding Accuracy Specifications. Get the Software.